Fragile Beauty tells the story of Hong Kong, taking you through the changes the city has seen over the years through modern dance. 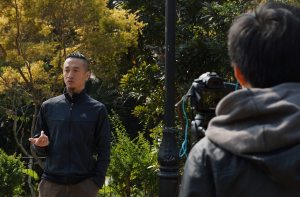 Indeed, from choreographer Sang Jijia’s perspective, the city has seen many changes over the thirteen years he has been gone and this 75 minute dance piece takes you through the personal and political journey the city and its people have experienced. The moment the lights came up the dancers on stage instantly command the attention of the audience. The ensemble moved as one, showing an immense power, and strength, and as the story progressed, you could begin to see manipulation taking place within the city. 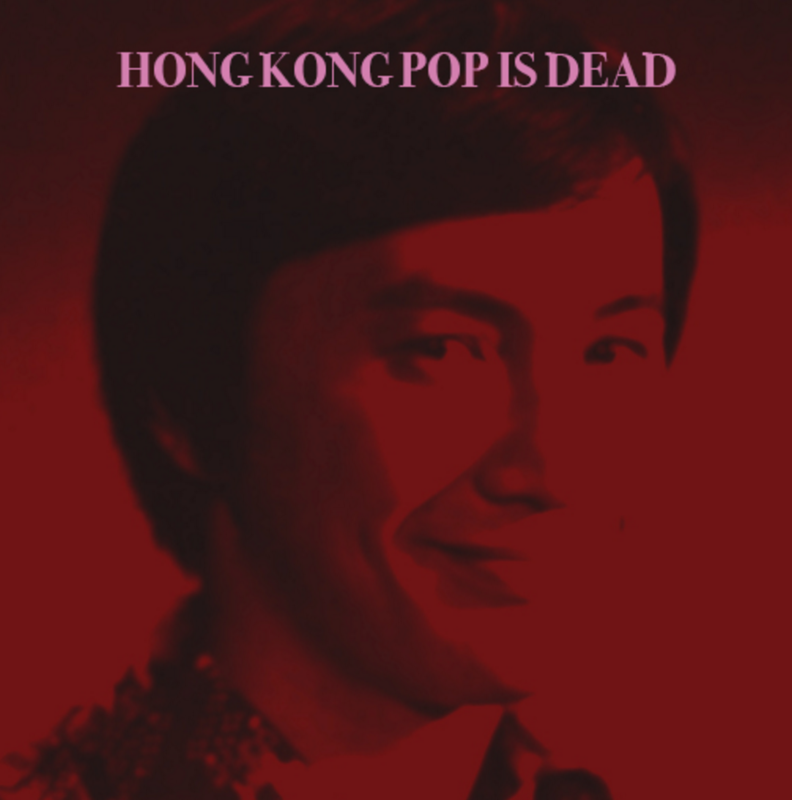 This was represented through stylized, repetitive sequences that brought more of a political theme to the progression of Hong Kong. The movement of the dancers showed continuous strain, drawing attention to the multiple and varied political struggles that have taken place over the years. Individual stories began to unfold, not just through dance, but through spoken word in both English and Cantonese, by some of the dancers. Stories were told sentence by sentence, first in Cantonese, then English. The triumvirate of dance, English, and Cantonese all happening simultaneously was quite powerful at times, however, there were moments when one or the other felt redundant, due to the size of the stage, and placement of the cast. At one point, there was a pair of dancers positioned upstage right who were verbally telling a story, and the accompanying dancers were as far away as possible, being positioned downstage left. Unfortunately, it was difficult to appreciate either piece in times like these. That being said, there were moments where the combination of all three allowed the audience to have a clearer understanding of the situation, and the effects that change can have to not just society as a whole but the individual, and the hardship and struggles they may experience. The performance utilised a number of different staging techniques. One of the most memorable being a section of silhouette dancers. Their stylized movement was sophistically staged and breathtaking from the moment they began. The fluidity of movement, and effortless choreography transported the audience with every move to moments they have experienced, and can relate to in Hong Kong life. It is without a doubt, that Sang Jijia captured the life, and soul of the city through its numerous changes. 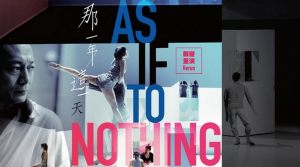 Even if you’re not one for modern dance, the music, and lighting in the performance will blow you away, as it too emphasises the change, growth, and cultural identity of Hong Kong. The deep, turbulent drums expressed the anger and frustration many feel with change, as the warm, familiar, but sometimes dim lighting kept you company throughout. Fragile Beauty is a must see for anyone who feels a connection with this city, or culture. 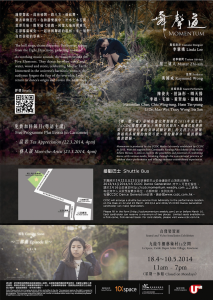 Fragile Beauty is playing at the Kwai Tsing Theatre through June 4th. For more information, click here. Internationally acclaimed Tibetan choreographer Sang Jijia’s last creation for City Contemporary Dance Company was the award-winning As If To Nothing in 2009. 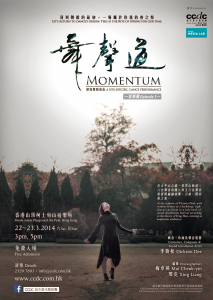 Last year he became the troupe’s resident choreographer and Fragile Beauty is his first new work in that role. 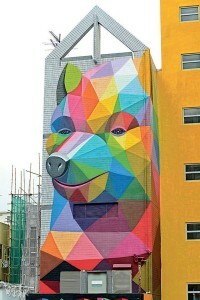 The premise of the production is the decline of life and happiness (the “fragility of beauty”) in a city – here, presumably, Hong Kong. There are glimpses of Sang’s undoubted skill as a choreographer, but the piece resorts too much to dialogue instead of expressing ideas through movement and while it’s good to see artists tackle major local issues, the picture Sang paints is so unremittingly bleak that it fails to engage. The piece opens with all the dancers on stage wearing long, brightly coloured skirts, in which they whirl and swirl before trooping off and returning in grim, prison uniform like costumes of white and grey which set the tone for the rest of the performance. The choreography bears Sang’s hallmarks of relentless kineticism and emphasis on ensemble work, where the dancers’ individuality is suppressed in favour of the group. There are some striking images, notably where a row of dancers spread out across the stage, slowly sink to their knees in unison while others continue to move. However, the choreography’s insistence on constant motion becomes tiring to watch. Contrast is similarly lacking in terms of emotion – the city is portrayed as a nightmare in which its hapless residents are trapped, with no note of hope. There are scenes of violence and chaos (a reference to Occupy Central and its aftermath, perhaps). One trio, with two men brutally attacking a girl who screams at the top of her voice throughout, is almost unendurable, not least for the ears. Another sequence, which appears to refer to Sars, employs multiple voices speaking at the same time and a lot of shrill screeching – the result is excruciating and makes one long to push a mute button. 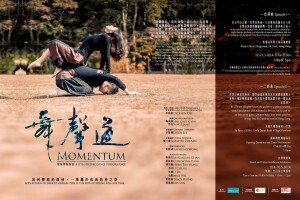 Two appealing monologues (in Chinese with English translation) by dancers about their childhood memories of Hong Kong and how old neighbourhoods have been transformed provide some respite from the tension but are overlong and seem disconnected from the rest of the piece. The dancers perform with commendable energy and commitment. Dickson Dee’s menacing, percussion-dominated score contributes to the sense of angst, as does Sang’s cleverly conceived, claustrophobic set of moving dark grey walls which hem in the stage. Acclaimed as “the most perfect dancer”, Sang Jijia was selected by the influential American choreographer William Forsythe to work with him at the Frankfurt Ballet for four years. At 23, Sang won the top prize in the men’s section of the 1996 Paris International Modern Dance Competition. He was hailed by the Guangdong province as “Star of the Century” in 1997. At 27, he joined the Rolex Mentor and Protégé Arts Initiative and studied choreography in Germany. Sang’s choreography combines extremely intense physical movement and unique rhythm to create psychological tension and anisotropy. 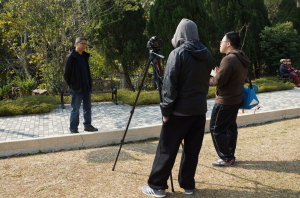 As an internationally renowned choreographer, Sang has choreographed and performed for numerous well-known dance companies in Europe and Asia at their invitation. Short film screening curated by So-So Film. 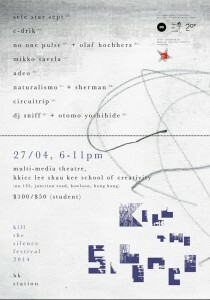 Following the huge success of the Kill The Silence Festival last year in Macau 18 acts and over 12 hours of live performance, this year we are bringing the festival to both Macau and Hong Kong in April. Kill The Silence is the only independent music festival that embraces rock, electronic, experimental, noise music and independent short film screening in a genres breaking and boundaries crossing environment. In association with Live Music Association. Otomo has been international recognized and prolific in his musical output which has spanned across Free Jazz, Noise, Free Improvisation, Sound Art, and compositions for large amateur ensembles. Over the years he has worked with luminary figures such as John Zorn, Christian Marclay, and Luc Ferrari. In 2013, Otomo won national recognition for his soundtrack for TV drama “Ama-chan” which aired every morning on the national public broadcasting network, NHK. The opening theme quickly became a hit and another song he wrote went on to win the National Records Award of Japan. Now Otomo is Japanese household name, which makes everything even more confusing. 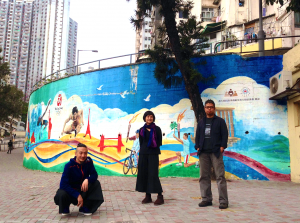 For this exclusive performance at SCM, local musicians Sin:Ned (Electronics), Fiona Lee (Electronics), Chin King (Guzheng), and dj sniff (turntables) will join Otomo in a unique performance inspired by his installation performances Yuheisha (幽閉者) and Ensembles. Additionally on Tuesday April 29th, Otomo will give a lecture on his work after the 2011 disaster in Japan, Project Fukushima. For more information check out the SCM announcement webpage.